The red Calico Hills reflected in the rear windows of our van. Only 17 miles from Sin City, there is a natural reprieve from the glitter and noise of the Strip. Red Rock Canyon has stunning 3,000-foot red sandstone cliffs and formations. The park was established, in part, to protect the endangered Desert Tortoise, and the visitor center even features a contained tortoise habitat where you might get a glimpse of the slow but rare species. Being right outside of Las Vegas, Red Rock is a popular day trip for both tourists and residents alike. When we were there in comfortable fall weather there were tons of other people there. It’s a national conservation area managed by the BLM, so if you have one of the annual national parks passes it’s free to enter. Otherwise, the day fee is $15/vehicle. Almost all of the hikes in the park are found along a 13-mile, one-way scenic drive. You’ve got to make a plan so that you don’t miss anything, unless you want to drive the road twice. Stop at the visitor center at the beginning of the drive to pick up visitor’s guide and trail map and check out the tortoise habitat. Our first stop was at the Calico Hills. Both the Calico I and Calico II trail run along the base of the of the red and pink striped Aztec sandstone formations. The trail offers plenty of opportunities to scramble around the exquisitely eroded gardens of boulders and ravines. The trail runs underneath the Calico Hills and you can climb on and explore the rocks. Striped Aztec sandstone in the Calico Hills. High Point Overlook along the Scenic Drive is definitely, well… a high point of the drive. You get a bird’s eye view of the whole canyon with the brilliant red Calico Hills on the east and the darker and taller, tan and black colored cliffs to the west. The High Point Overlook is a good spot to see the entire valley. A tarantula that we spotted in the park. 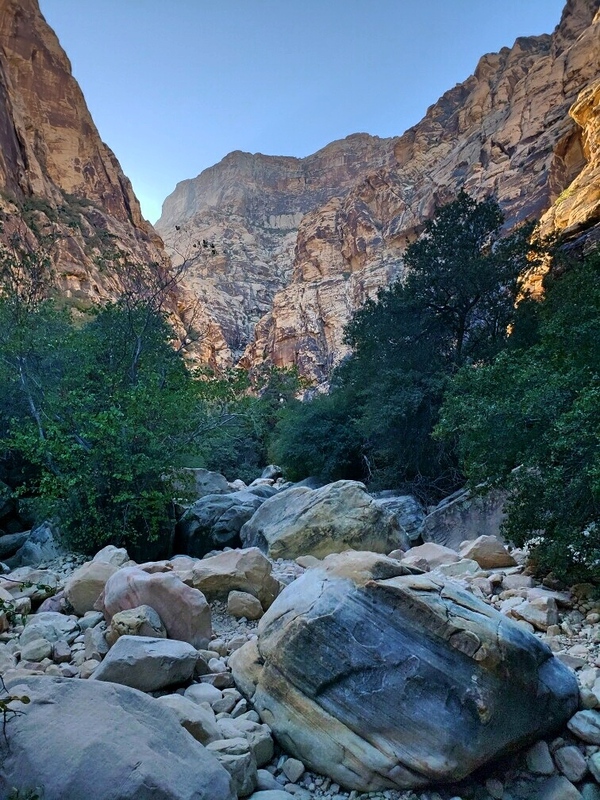 By far our favorite place in Red Rock Canyon was Ice Box Canyon. Ice Box Canyon is named that because it is often one of the coolest spots in the park. We hiked it in the afternoon, and we were totally protected from the sun the entire time. The hike is a 2.6-mile out-and-back trail. The trail starts out across a short stretch of open desert to the entrance to the canyon in the cliffs on the western side of the park. On this stretch, we spotted a desert tortoise, which had retracted into its shell. A Desert Tortoise along the trail to Ice Box Canyon. The entrance to Ice Box Canyon from the open desert part of the trail. The walls of Ice Box Canyon have years of stains from water running over them. Once inside the canyon, the trail begins to pass over jumbled and piled boulders, There isn’t always a clear best route, so we just picked whatever route seemed easiest to us. Toward the end of the canyon, the boulders become progressively larger, and the scrambling becomes a bit more strenuous. In some places, it was actually easier to go under some pile rocks rather than over the top. You’ll know you are at the end of the hike by the 160-foot headwall for a waterfall. In some seasons, there is a flowing waterfall. I’m sure would be incredibly beautiful, but when we were there was no water flowing and it was still awesome. There are boulders you have to navigate around on the trail. The headwall of the waterfall where the hike ends. We explored a bit beyond the headwall of the waterfall on a side branch of the canyon. We actually weren’t sure we had reached the end, so we continued scrambling up where the canyon branches to the northwest (right from the trail). We discovered another short wall where there was a length of knotted webbing you could use to get over. We realized the webbing must be for climbers to access to some of the 1700 climbing routes in the park and that it was probably not a part of the trail anymore. After a bit of cajoling, I convinced Ian that we would not be pulling ourselves up some random webbing and we headed back to the waterfall. The last portion of the hike to get to the pools of water held by the rock beneath the waterfall’s headwall is a bit tricky, and not everyone doing the hike while we were there did that portion. Coming down was definitely way more difficult than going up! The pools themselves are nothing special, just dark dirty water. Seeing how the rock wall has been smoothed and eroded by the water though is incredible. If you’re capable of climbing up there, it’s certainly worth it. Kaylee standing near one of the dark pools of water left by the waterfall. A photo taken by Ian, while looking down on the other hikers in the canyon. Free camping nearby: We camped along Lovell Canyon Road in the Mountain Springs National Recreation Area. We camped here for two nights, although we wouldn’t necessarily recommend this spot. Read about our eventful run along Lovell Canyon Road in our Las Vegas blog post.